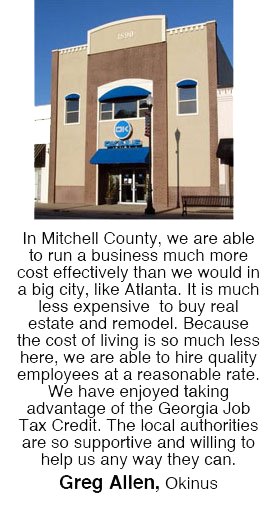 Mitchell County is committed to a business friendly atmosphere. We want our community to grow and prosper, so we offer local incentives to encourage business startup, relocation, and expansion. Let us help you and your business. Industrial Revenue Bond Financing: The Mitchell County Development Authority will act as a financing vehicle to issue taxable and tax-exempt bonds to qualifying projects. Freeport Exemption: Mitchell County provides 100% property tax exemption on raw materials, work in progress, and inventory of completed products. Regional Training Program: The local Workforce Investment Board has a training program that will pay 50% of your payroll for up to 1/4 of your workforce while they are in training. The program could save up to 12-1/2% on your total payroll expense. There is no time or monetary limits on the program. Building Permits: The Mitchell County Development Authority will work with the Mitchell County Board of Commissioners in an attempt to reduce any building permit fees for the project. Utility Tap Fees: The Mitchell County Development Authority will work with the cities of Camilla, Pelham, Baconton, and Sale City for reduced tap fees for water and sewer service at the new facility. Lease Concessions: Lease concessions on existing buildings may be available for certain projects. Our investment depends upon your investment in capital improvements, equipment, and jobs. Land Pricing: Property within publicly owned industrial parks may be available to you at a reduced cost for new or expanding companies in Mitchell County. Our investment depends on your investment in capital improvements, equipment, and jobs. Infrastructure Improvements: The Mitchell County Development Authority will request assistance of the County to do any preliminary site work such as clearing and grubbing on a new publicly owned site. Site Development Costs: The Mitchell County Development Authority will use all available resources to do preliminary site and design work to reduce the overall cost of the project. Revolving Loan Fund: This loan fund is a locally controlled source of capital used to finance startup and expanding businesses whose projects meet the requirements. Georgia wants YOU and YOUR BUSINESS! So to get down to business the state offers incentives to help you get your business going. Quick Start: Job training for new employees through the Southwest Georgia Technical College will be provided at no cost to companies creating fifteen or more jobs. Retraining Tax Credit: Tax credits equal to 50% of the costs of retraining employees up to $500 per student are available. The credit can be taken every year that the company trains their employees for new jobs/skills. Any new employees can be trained under the Quick Start Program at no cost. Job Tax Credits: Mitchell County is a member of a joint development authority and can offer a $4,000 tax credit for each job created by a new or expanding business. The credit is applicable to Georgia Corporate income taxes or payroll taxes and may be accrued over a five year period. The tax credit can amount to $400,000 based on 20 jobs. Investment Tax Credits: The investment tax credit is offered as an alternate to the Job Tax Credit. The program allows a taxpayer that has operated an existing manufacturing facility in the state for the previous three years to obtain a credit against income tax liability. Mitchell County companies must invest $50,000 to receive a 3% credit. The credit is a percentage of the total value of all qualified property and cannot be more than 50% of the taxpayers total state income tax liability for that taxable year. Manufacturing Machinery Sales Tax Exemption: New and upgraded equipment is exempt from sales and use tax for a new or expanded plant. For each $1,000,000 invested in new machinery, a business can save $70,000 based on the current tax structure. Child Care Credit: Employers who provide or sponsor childcare for employees are eligible for a tax credit of up to 50% of the direct cost of operation to the employer. Hope Scholarship Program: HOPE is Georgia’s unique program that rewards high school students’ hard work with financial assistance in degree, diploma, or certificate programs at any Georgia public or private college, university, or technical institute. The program will ensure your company will have an educated, trained workforce as long as it is located in Georgia. For additional assistance please click on the Economic Development Partners.